A grade II water pumping station built to impress! Situated on the edge of Sherwood Forest, Boughton Pumping Station opened in 1905 together with an associated Superintendent’s house and 5 workers cottages which were maintained to a meticulously high standard. The Blackburn Engine House, the main pumphouse, was designed by William Beedham Starr which included a flamboyant huge brick chimney which forms a distinctive local landmark. 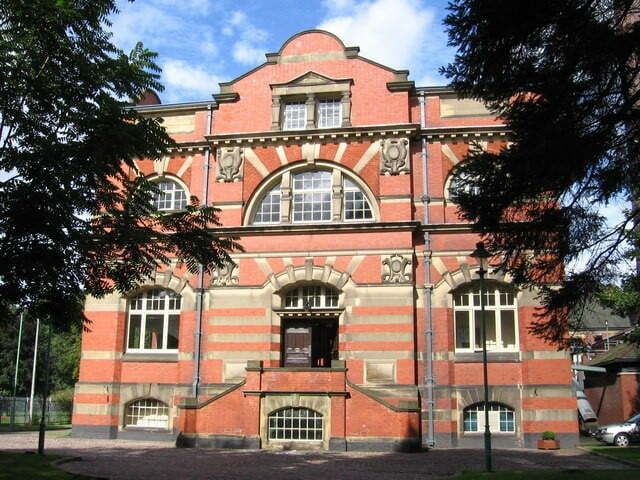 The Pumphouse was commissioned by the Nottingham Corporation Water Department and was capable of pumping 20 million imperial gallons (91,000 m3) per day through 15.75 miles (25.35 km) of 30-inch (76 cm) pipe from the underground sandstone Aquifer. There were two Manhattan-type triple-expansion steam engines from Ashton Frost of Blackburn, with standby 130 hp (97 kW) Davy horizontal engine and triple-expansion engine by Fairbairn Lawson Combe Barbour. Boughton Pumping Station later passed into the hands of Severn Trent Water. The engine house was listed as Grade II in 1974. By 1980 it was obsolete and in need of major repair. In 1988 the uncertain future of the building took a sudden turn for the worst when it suffered mining subsidence. The damage to the buildings and surrounding landscape was alarming and the future of the building looked bleak. Boughton Pumping Station Partnership Trust secured funding to restore the buildings and by 1998 the works were complete. Since its completion in 1998 the Station has been operated as a Business Centre by several previous owners, Boughton Pumping Station Trust, Nottinghamshire County Council and NE Group. In April 2010 it was privately purchased by Horizon Investments and re-launched as Blackburn House after the original Blackburn Engines which enabled it to pump water from its well to the homes in the City of Nottingham. The Pumping Station was transformed by new owners in 2016 into a new venue primarily for weddings, but also for corporate and private events, as well as filming and photography location.